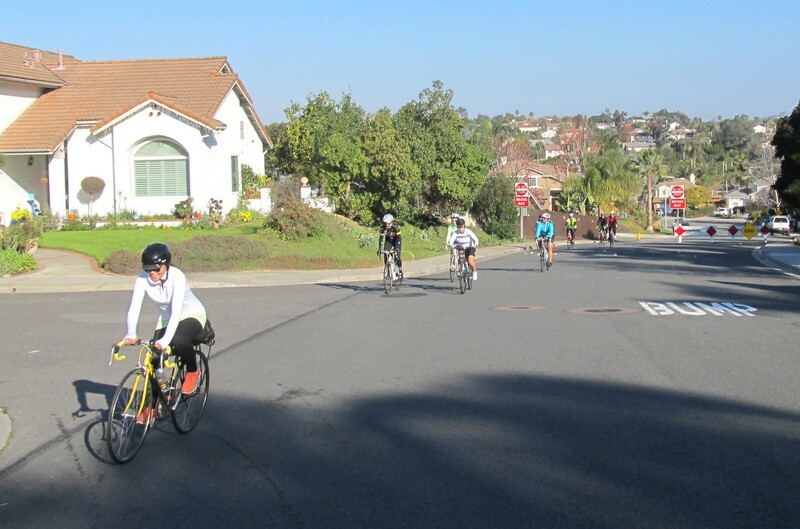 We had a big turn out for the first ride of 2015. 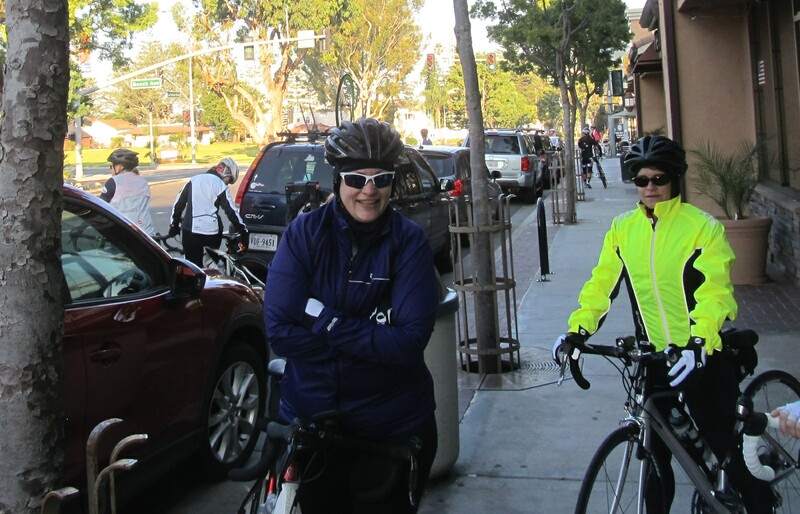 I think there were 21 of us huddling in front of Carbon Connection Cyclery in Carlsbad on Saturday morning trying not to freeze before we could get on our bike! Ten brave souls went with Turbo Jill for the combined A/B route into Rancho Santa Fe, where I heard they collectively slew a particularly fiery dragon up on the hills of Rancho Santa Fe Farms before coming back to the shop. Ya.. it was that cold a morning! A/B crew safely back to the shop. With me (Michell) for the more reasonable (ahem!) 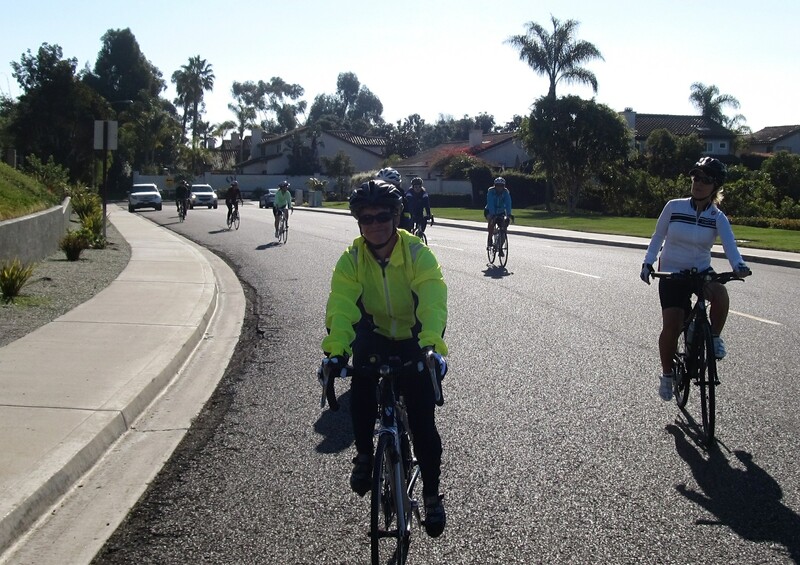 C ride into the less-known corners of Encinitas and Leucadia were nine fun gals and an equally fun husband. We were a merry bunch and sauntered our way down into La Costa at a pretty out-going pace (tho briskness did creep in a bit when the sun got screened by the hill and we suddenly could no longer feel our ears and fingers). Luckily, Jill – our organizer & routes-planner for the month – had anticipated polar bear weather and plotted natural heaters (my favorite euphemism for hills) for us to scale at intervals. They were very effective at keeping our core temperature well above optimum icicle-forming range. Dunno how Brielle, Laura & Miki made it thru the first few miles w/o leg warmers! Tho we were all well heated up after topping out Village View Dr! The first hill of the day, the Orchard Woods – Village View U climb, is a really generous heater that kept the temperature up with each of its turns… I can’t tell you how proud I am that we all made it to the top with lungs and legs intact… and with hardly a fuss (tho, truth be told, the gradient there wasn’t very encouraging of fussing while climbing). The nice and neighborly descent south on Arbor Glen Dr was a nice reward, though, and we easy spun down it while admiring the multitude of local dogs that were out walking their owners and enjoying the park-like view. That was, of course, until Brielle’s brand new bike got torpedoed. 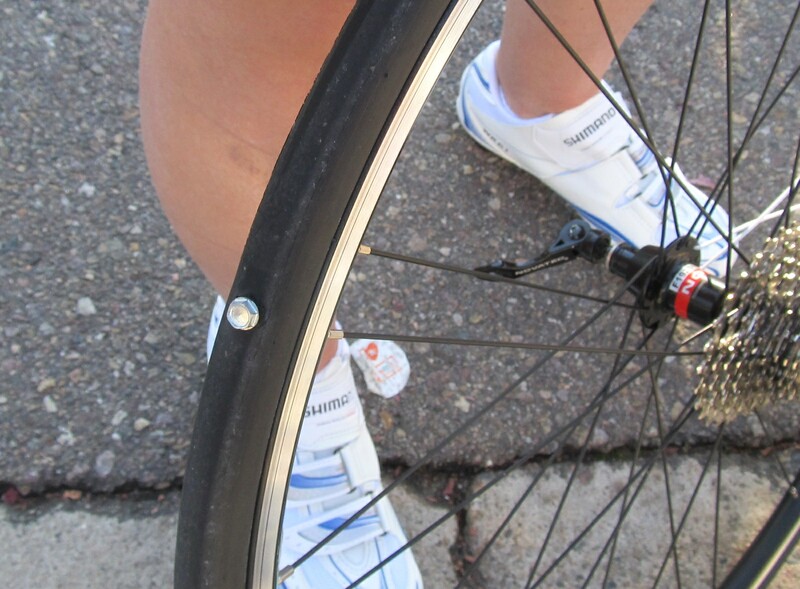 Now that’s a proper way to puncture! 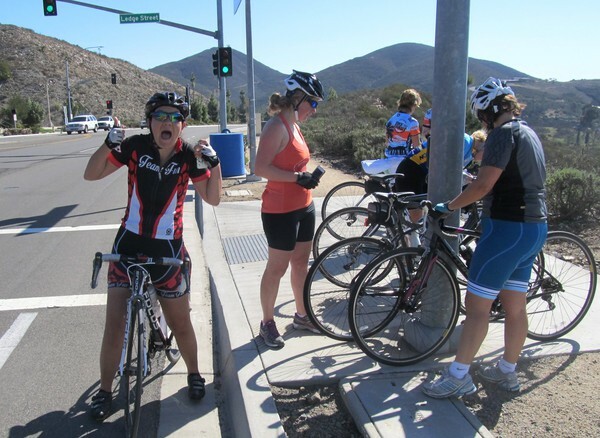 Brielle changed her own flat while a few of us cheered on. I do mean torpedoed!! I couldn’t even do a Continental Gatorskin/Hardshell sales pitch on her since it would have taken nothing less than a bullet-proof tractor tire to not succumb to that thing. It would take more than a screw to screw a Team Fun ride, however, and Brielle ably changed her first flat with some help from Maryann and Dean while I gleefully took photos. Even de-torpedoing can be fun with the right company! 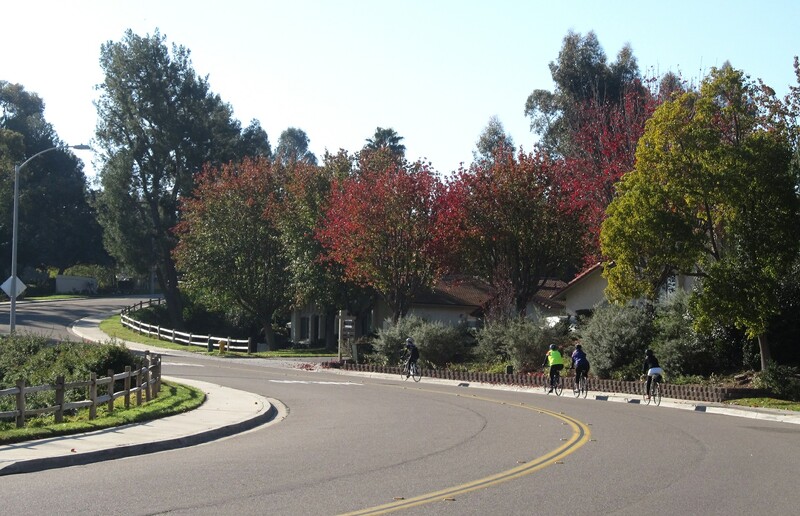 A colorful little climb on Willowsprings Dr. Most of the climbing now done, it was all smile on Lake Dr! But all the fun has to be paid for! Our small ring got to see some work on the beautiful S-curve climb on Willowsprings Dr from Encinitas Blvd past the High Country Villas golf course to El Camino Real and on up Santa Fe Dr before we could duck into more low-traffic neighborly & flat lane that is Crest Dr. Jill also routed us through a couple cool bike/ped-only neighborhood passages that really put the charm into our ride as we made our way back to the coast. I LOVE finding passage ways like this. Thanks, Jill! 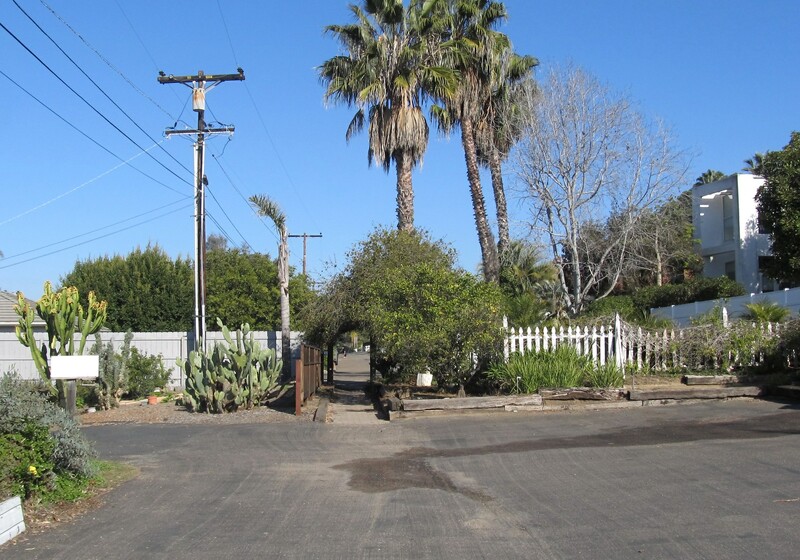 Thru more Encinitas back roads. 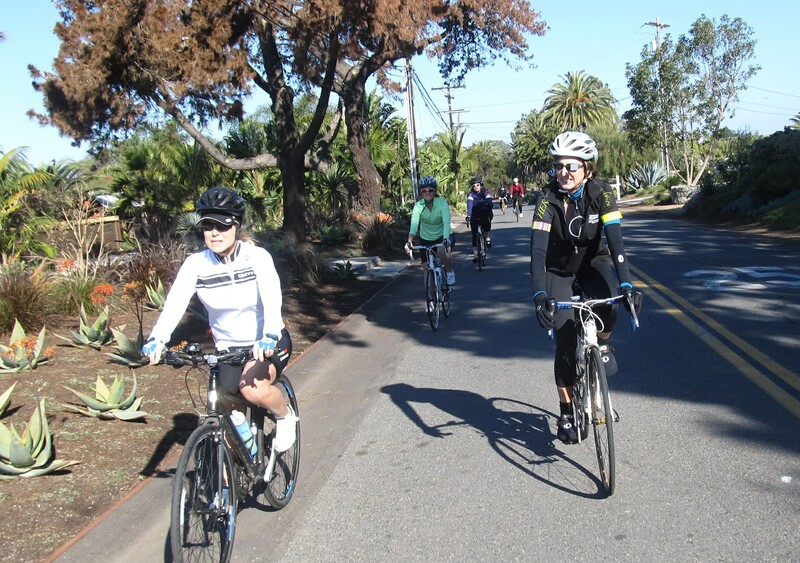 It was another wonderful morning on the bike with an amazing group of supportive fun gals. Thanks very much everyone for being so patient! (Thanks a bunch to Jill for coming out to lead the A/B group even though she was obviously still under the weather, too!). Next Saturday (January 10th) we are revisiting San Elijo Hills for the first time in many months. Those wanting to burn extra calories have the option to go all the way up Double Peak, also. Come out and join our fun!